Today’s GDP figures look good on an annual basis, but they hide a slowdown in the last two quarters that starts to look like a trend. GDP, grew 0.5% in the fourth quarter of the year, compared with 0.7% in the third and a recent peak of 0.8% in the second. A big concern is that growth is being driven by retail and consumer spending - not the balanced recovery that is really needed. Manufacturing and investment is petering out. As the TUC has pointed out today, the Treasury has fallen back on that old statistical trick of recalibrating its data back to 2014, rather than the much less favourable 2010, when the ConDems took over. The UK now languishes well down the OECD growth league table. We should also not forget that this is the slowest recovery in history. Many have argued that Britain's economy before the 2008 crash was too reliant on debt-fuelled consumer spending. We know from the OBR analysis of the Chancellor’s Autumn Statement that he is relying on households going heavily into debt to drive his economic recovery. When what Britain really needs is a pay rise. 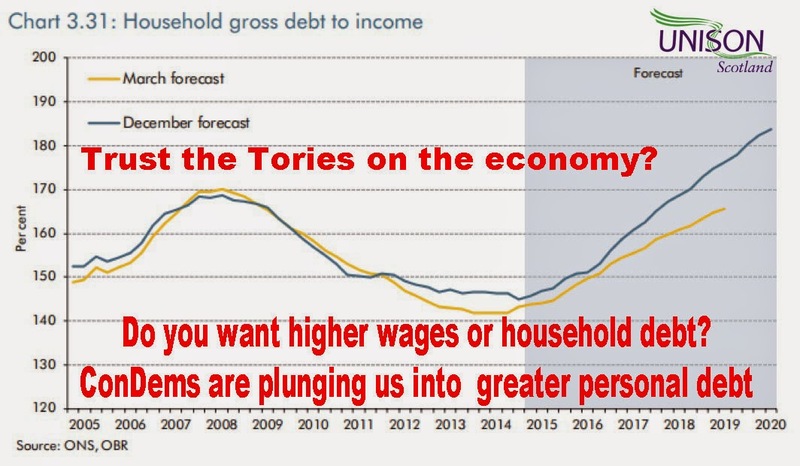 Shadow chancellor Ed Balls said the slowdown in fourth-quarter growth was a concern, and that, "Tory claims that the economy is fixed will ring hollow with working people" whose "wages are down by £1,600 a year since 2010". Indeed! The fall in gas and petrol prices will help the inflation figures, but unless wages increase this will provide only a temporary fillip and not the sustainable growth we need. It could also provide a further knock to our unsustainably large current account deficit. 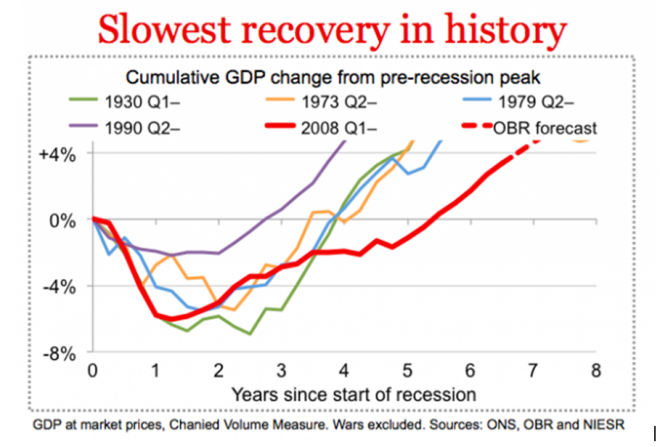 The other question we should ask is who has paid most for the recovery? The JRF and others have published the final papers in a series of detailed academic reports that show how poorer and vulnerable groups have been disproportionately hurt by austerity economics. Tax credits and cash benefits took more away from those in the bottom half of the income spectrum than they gained from increases to tax allowances. Savings made from rebalancing of benefits and tax allowances were wiped out by cuts in income tax for the better off. 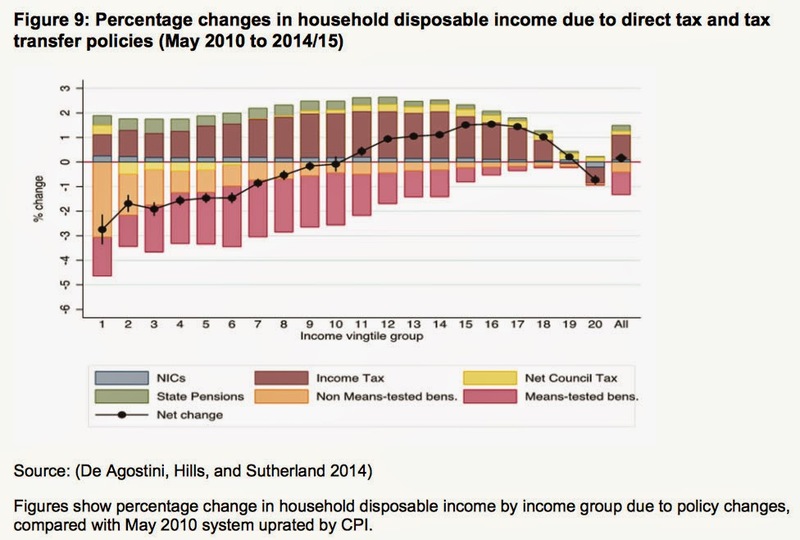 As this chart shows the changes to direct taxes and benefits have had no real effect overall on the public finances. Almost all of the savings achieved by cutting benefits were offset by gains for richer groups. It is also interesting to look at the impact on different groups. 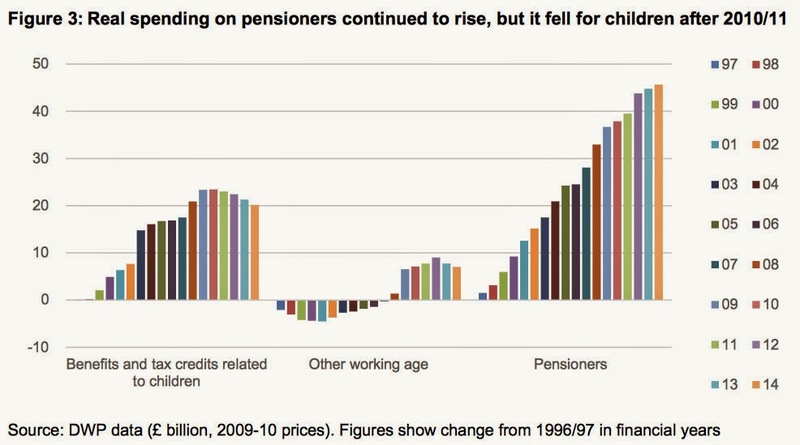 As this chart shows pensioners have been protected (because they vote? ), while the working poor, and latterly children, have suffered more. Overall, while there may be a limited recovery for some, even that is faltering, and it is workers and the vulnerable who continue to pay the price. Energy prices are back in the news as politicians call on the energy companies to reflect the oil price fall in their gas and electricity prices. EoN were first out with a gas price cut, followed by British Gas and now ScottishPower. The Prime Minister claimed this undermined Labour's price freeze, although just how a cap stops a price cut isn't really explained. Ed Miliband described the 5% fall as "too little, too late" when wholesale prices were falling by approximately 20%. As oil prices have more than halved, why haven't the energy companies been quicker to pass on the savings to consumers? It is certainly the case that wholesale reductions don't have a similar impact on retail bills. Primarily because wholesale costs only make up half the average consumer bill. Only 30% of the gas in Europe is now bought on the price of oil, probably even less than that in the UK. Companies also buy a lot of supply in forward markets, up to two years ahead of use. In the longer term, companies will point out that the Autumn Statement says levies on energy companies are set to rise by £6.3bn over the next seven years. However, falling prices do give some headroom for reductions and there is a suspicion that companies are defending their retail margins after the mild 2013/14 winter. Gas demand was down 10-20% last winter. A 25% drop in forward wholesale prices for gas should drive at least a 10% cut in retail prices. Ofgem estimates that the supply margins of the Big Six have doubled in the last twelve months, increasing from 4% (£49) in 2013 to 8% (£105) today. The average household’s annual energy bill is now £260 higher compared to 2010 and the poorest 10% of households have seen their energy bills rise nearly twice as fast as other households. Hardly surprising then that Ofgem has referred the energy companies to the Competition regular stating: "We found that suppliers do not adjust their prices as quickly when costs fall compared to when wholesale costs rise… ". Typically masterly understatement from the toothless regulator! We are also not seeing reductions on the scale expected because companies are more focused on share price than consumers. Every 1% off retail prices cuts around 5% off SSE's earnings per share. Another by-product of a privatised industry. Smaller companies are able to respond to wholesale price changes more quickly because they have less risk. Another argument in favour of a more diversified ownership model that includes local authority energy generation. Labour's solution is to give Ofgem (or its replacement) the power to make energy companies pass on cuts in the cost of oil and gas to bill payers. Ed Miliband said: "Let’s reduce energy bills for consumers. We can do that as well as having this freeze to make sure energy bills don’t rise." The SNP has not taken a strong line over the energy companies, but instead have been calling for an increase in the Winter Fuel Payment. Chic Brodie MSP said: "Energy bills have increased by over 37% since 2000-01 and if winter fuel allowance had increased by inflation since 2000-01, pensioners would be £76 better off in 2014-15 than they are". This allowance is to be devolved to Scotland under the Smith agreement. Whatever the economics say, Miliband and Osborne both calling for price cuts is going to keep the energy companies spin doctors busy in the run up to the General Election. The consequences of austerity economics dominate budget setting at UK, Scottish and local authority level. The Budget Bill was presented to the Scottish Parliament this week. Over five years the Scottish budget has been cut by around 10% in real terms with the capital budget facing a real terms cut of 26% as a result of the UK Government’s austerity programme. For the coming year this means a 1.7% real terms cut in the budget. There is little new in the Bill from the Scottish Government’s original spending plans that I outlined last October. John Swinney will be privately congratulating himself that he didn’t press devolving oil revenues at the Smith Commission. The Scottish Government’s White Paper assumed that offshore receipts would be between £6.8bn and £7.9bn in 2016-17. At the current oil price those revenues would be around £1bn – that’s a £6bn cut in revenues available for public services. There is a perfectly respectable case for independence, but swapping the Barnett formula for devolved oil revenues, as the SNP proposes, is simply reckless. Its not been a good time for John Swinney, normally the proverbial ‘safe pair of hands’. He has also been embarrassed by the £444m underspend in the Scottish Budget. This is an astonishingly high figure and he shouldn’t be surprised by the criticism, given that he has claimed credit for low underspends in previous years. He has also done two U-turns on taxation – scrapping his ‘Tesco’ tax and now amending his more progressive replacement for Stamp Duty. I actually thought he got both of these right first time, showing some imagination and adopting progressive tax principles - unlike the regressive Council Tax freeze. One positive announcement is using the Barnett consequentials from the UK Autumn Statement to allocate £100m to address bed blocking. This is the biggest challenge facing the care sector at present and it is a direct consequence of council cuts. Frankly, a bigger priority that Jim Murphy’s 1000 extra nurses. While we certainly need more nurses and other members of the health team – it’s social care that is in the immediate greatest need. Having said that, £100m over three years is nowhere near enough cash and is being rolled out too slowly. This year’s council budget setting is a particularly fraught process. Most are struggling to balance their budgets as they bear the brunt of cuts. They will be looking at the Scottish Government’s underspend and wondering why that hasn’t been allocated to the many pressing needs at local level. I highlighted some of these in a UNISON briefing to MSPs last week. That leaves us with the root cause of Scotland’s financial problems – the UK coalition government. We had political row over the Westminster vote on the Charter for Budget Responsibility. While this is largely political froth, it does highlight a mixed message problem for Labour. They want to appear tough on economic credibility, while at the same time attack the Tories and LibDems on austerity. While Labour’s spending plans are not all I might wish them to be, they are planning a different approach. As the independent Institute of Fiscal Studies (IFS) analysis of the political parties plans puts it, Labour’s looser fiscal policy allows them to “spend more or tax less to the tune of around £43bn in 2019-20 and still remain on course (just) to achieve their targets”. That is before any additional taxation, such as the planned ‘Mansion tax’ or an increase to the top rate of income tax. While it’s the UK coalition government’s ideological attack on public services that is at the core of the budget problems in Scotland – the Scottish Government has also made some poor choices. Could do better, is the commentary on this year’s budget report card. Labour also needs to recognise that mixed messages confuses the very voters they are trying to attract. Fracking - over to you! Some astute politics by Labour and Tom Greatrex MP puts decisions on fracking very firmly in the Scottish Government's court. The Smith Agreement proposes the devolution of licences for gas exploration. The political significance is that the Scottish Government Energy Minister, Fergus Ewing, has used the UK government's plans on underground access rights, to give the impression that he opposes fracking. This is simply a political fig leaf, as I explained in an article last November in Utilities Scotland; "Scottish Government already has planning powers that could end the prospect of fracking in Scotland now. They have used these powers to stop new nuclear power stations, but not fracking. Simply put, Ineos are making this level of investment because they are confident that the Scottish Government is not going to stand in their way." Labour MP Tom Greatrex pressed home this point by lodging amendments to the Infrastructure Bill requesting that full powers over shale gas exploration be given to the Scottish Parliament ahead of the general election. The coalition government did not back this as such, but instead pledged to exclude Scotland from the impending legislation. 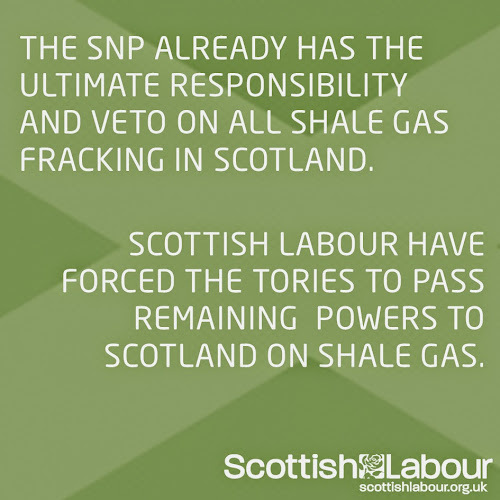 "The Tory-led Government have belatedly conceded Scottish Labour amendments to force the devolution of the remaining secondary parts of the framework for shale gas in Scotland, effectively implementing these parts of the Smith Agreement prior to the general election. "Whilst some in Holyrood would like to pretend that the Scottish Government is powerless to act over fracking, the truth is that already nothing can happen at all in Scotland without the approval of ministers in Edinburgh. 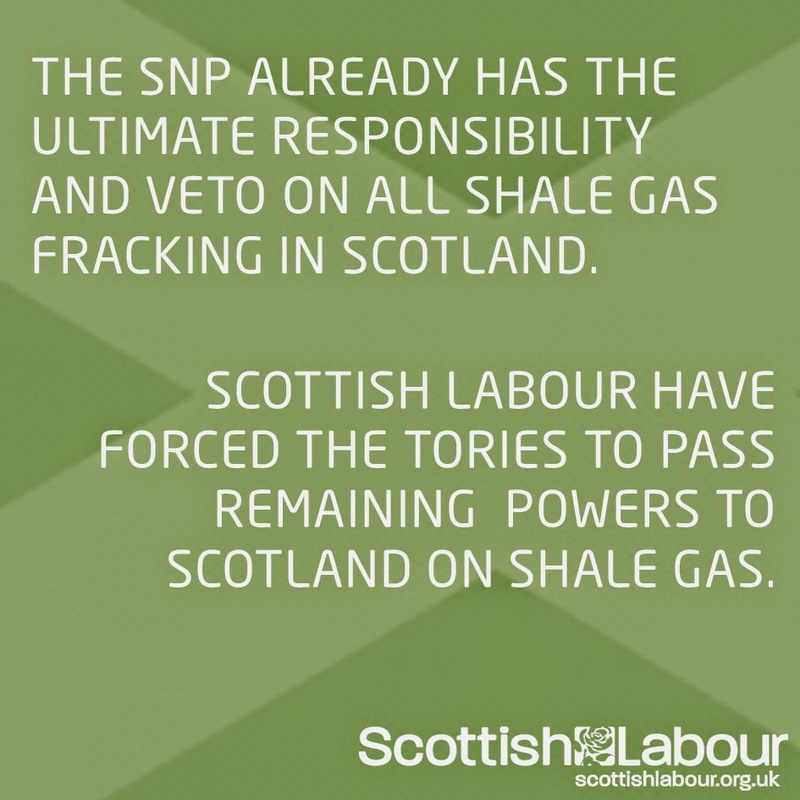 Their control over the planning and permitting regime gives the SNP ultimate responsibility and an effective veto for shale gas extraction in Scotland. "But in the context of devolved planning and permitting regimes, it makes sense for underground mineral access rights, which are essentially a secondary aspect of the planning process, should be devolved as well. Labour have won a major concession from the Government on this point, who will now exclude Scotland from changes being made in the Infrastructure Bill." Of course Scottish Labour isn't opposed in principle to fracking either and has instead said it cannot go ahead unless we have a system of robust environmental regulation and comprehensive inspection. However, they are not the government making this decision. Friends of the Earth Scotland Director, Richard Dixon put it well in his recent opinion piece in The Scotsman: "Circumstances are conspiring to ensure that in the next few months, the SNP will have to come off the fence and either decisively stop the unconventional gas industry north of the Border or admit that they are happy to let big companies like INEOS drill and frack significant parts of Scotland." Indeed, when you run out of others to blame - for government's, real politics can sometimes be very difficult! Scotland's public services are living through a lost decade as a consequence of austerity economics and we can do more to protect public services. Tomorrow (Tuesday 13 January 2015) the Scottish Parliament will debate protecting public services. UNISON Scotland's briefing to MSP's draws from our recent report 'Austerity Economics Don't Add Up', which charts the impact austerity economics is having on Scotland’s public services and the staff who deliver them. Austerity is damaging people’s lives and health, hitting low-paid women hard, causing misery, risking a lost generation of young people who can’t find work, and creating greater levels of income inequality, which is bad for the economy, for those on the lowest incomes and for society in general. In addition, we have been undertaking a series of surveys of public service workers in different occupational groups. You can access some of these on our Public Works web page. Our surveys let staff express their concerns about our public services in their own words. The impact of cuts on service delivery and in particular on the most vulnerable in our communities. Social care is a particular concern with a race to the bottom in provision. Corners are being cut to give the impression that services are being maintained. Whether its food sampling, inspections, hospital cleaning or the time elderly people are allocated for basic care. Core infrastructure is collapsing while staff patch and mend. Sticking plasters won’t last forever. Preventative work is being abandoned as staff focus on the basic statutory functions. Moving staff around to manage one crisis after another. ‘Keeping the plates spinning’ is a very common comment from staff. Growing levels of stress and related health issues. A particular challenge for what is becoming an ageing workforce due to recruitment freezes. Delayering of structures results in quite junior staff having to take decisions, without adequate support from more senior and experienced staff. Cuts in support staff and administration results in front line staff having to spend more time on paperwork - exacerbated by outdated or inadequate IT systems. Increased aggression and violence from service users, frustrated by service cuts and delays. The overwhelming forward looking response from staff is that it’s bad now, but they believe it is going to get worse. This is happening at a time when public service wages have been slashed in real terms placing significant personal pressures on staff. The importance of the preventative agenda in public service reform was highlighted again today by the Finance Committee. However, in practice it is clear that this is being abandoned by staff who are forced to fall back on reactive solutions. I hope MSP's will also recognise that there is a better way. Of course the driving force for austerity comes from the UK coalition government, but Holyrood doesn't always make good choices. What is needed is the political will to challenge the view that austerity is necessary and to put in place better policies that deliver for all our communities.